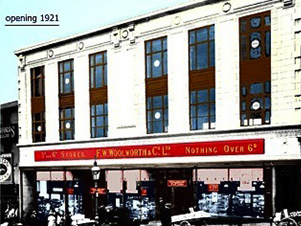 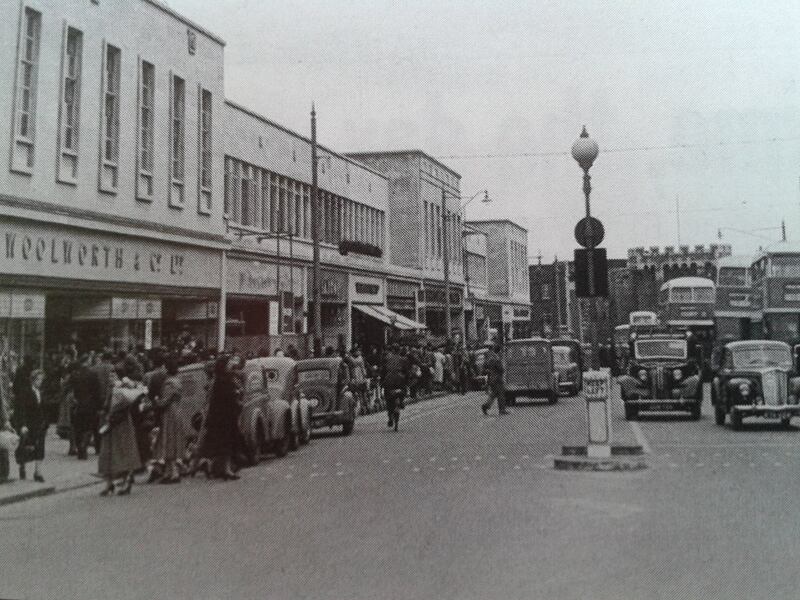 Woolworths opened their second Brighton store on 29th October 1927 at 1-2 London Road, on the corner of Cheapside. 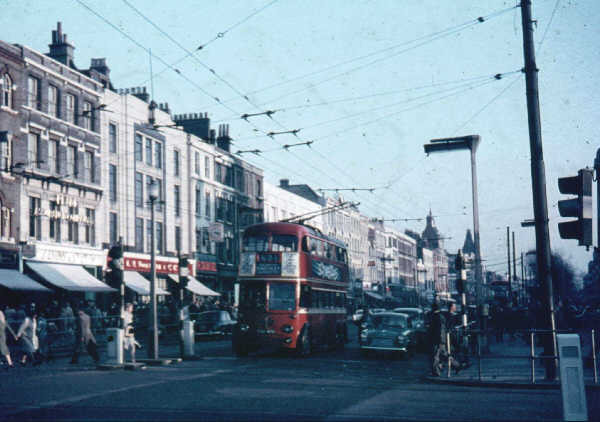 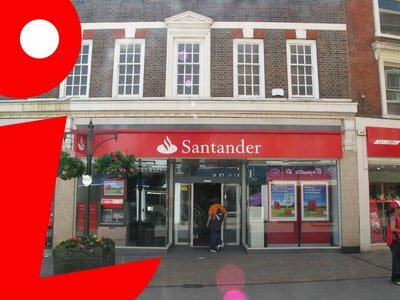 This branch was nearer to the two railway stations, whereas Store 73 was closer to the seafront. 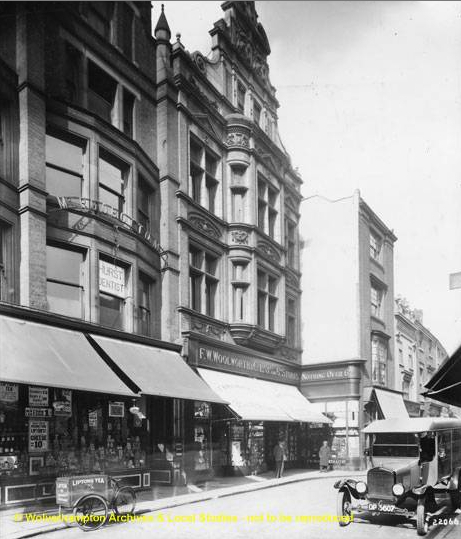 On 8th June 1934, the store was extended, it looks like into the roof, and possibly to the rear. 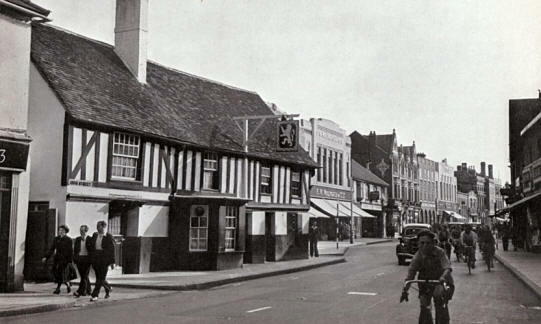 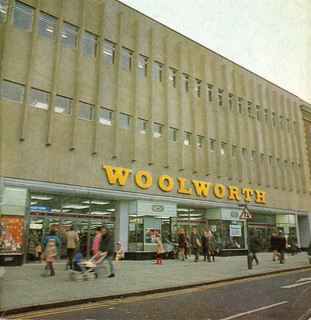 In 1965 Woolworths left the premises at 1-2 London Road. 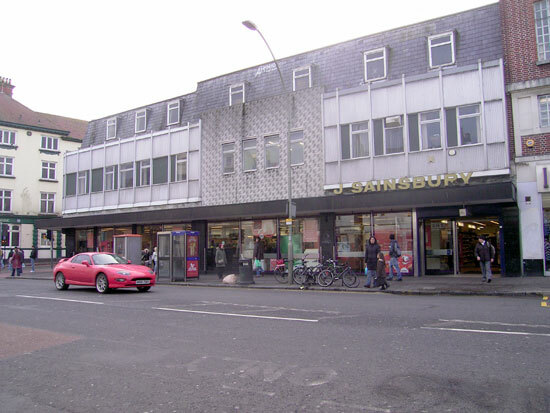 Sainsbury’s, who were next door at No.3, took it over to become a larger self-service supermarket at 1-4. 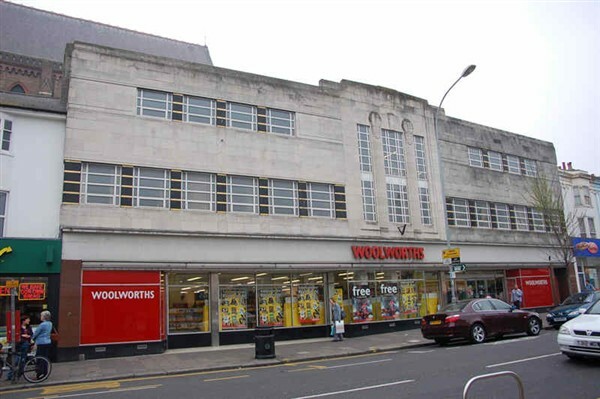 What I find interesting it that with all the alterations, they kept the 3 little roof windows in the style of the original Woolworths store. 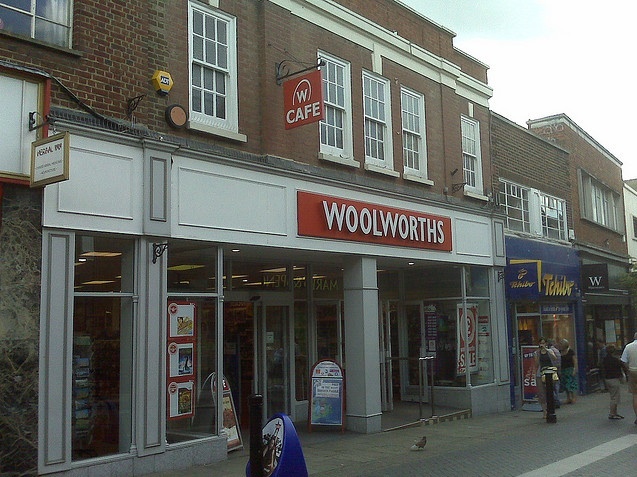 They traded here until 28th February 2007. 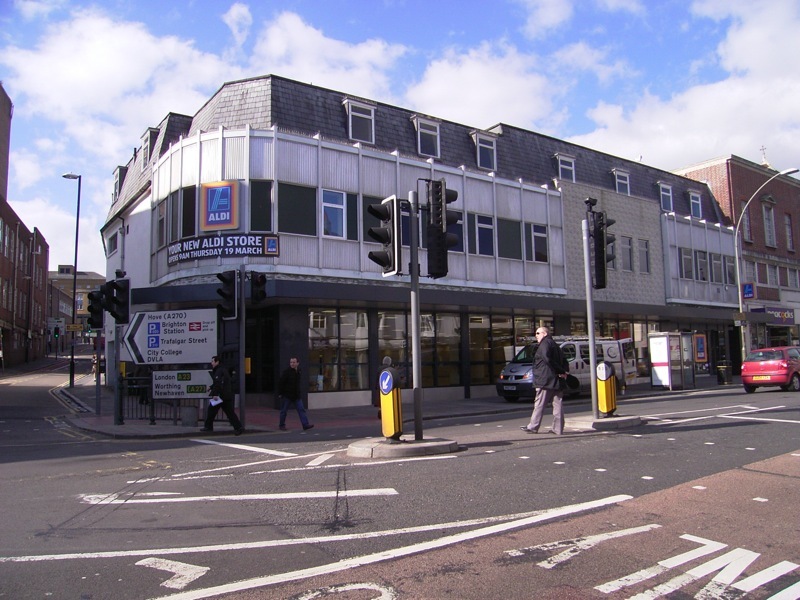 More recently Aldi started trading from here, from 19th March 2009. 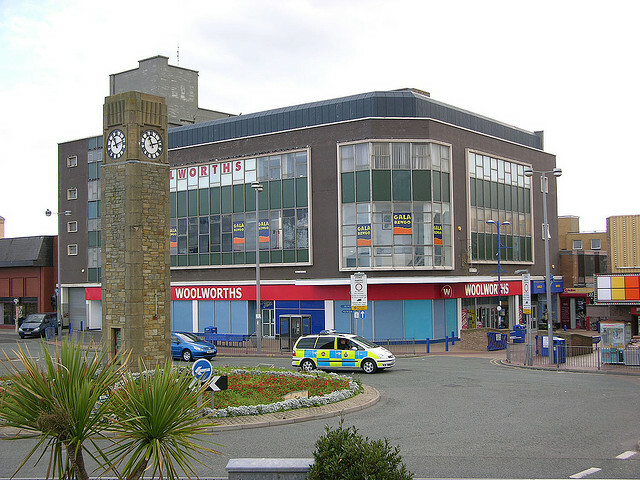 In 1965 Woolworths relocated up the road to 27-31, a larger Art Deco building (a former department store called Roslings) with 3 floors. 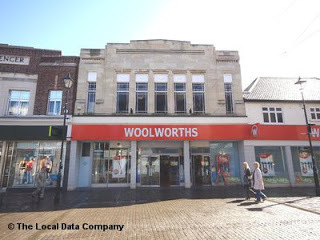 From the below photo it looks as though Woolworths bought the shop next door as well as Roslings, and then recreated the Art Deco front on the other side. 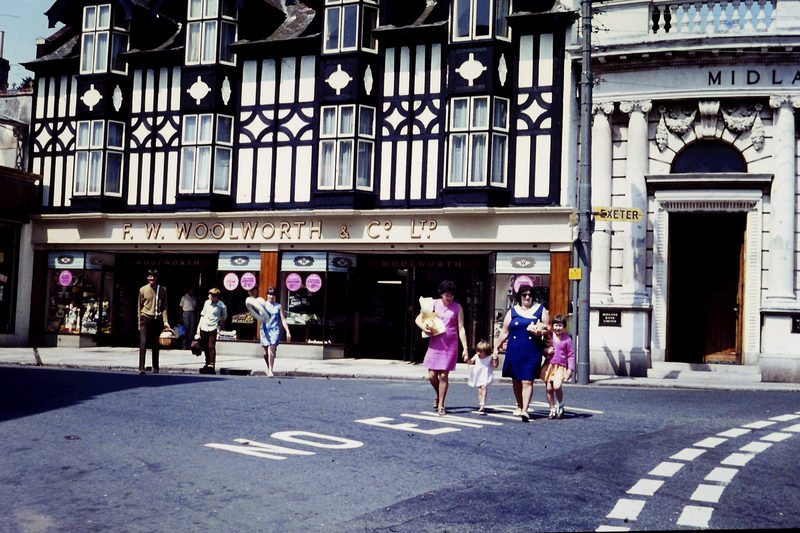 The store was re-modernised in the 1980s, and then there was an arson fire in the basement in 1987 – so they had to close temporarily. 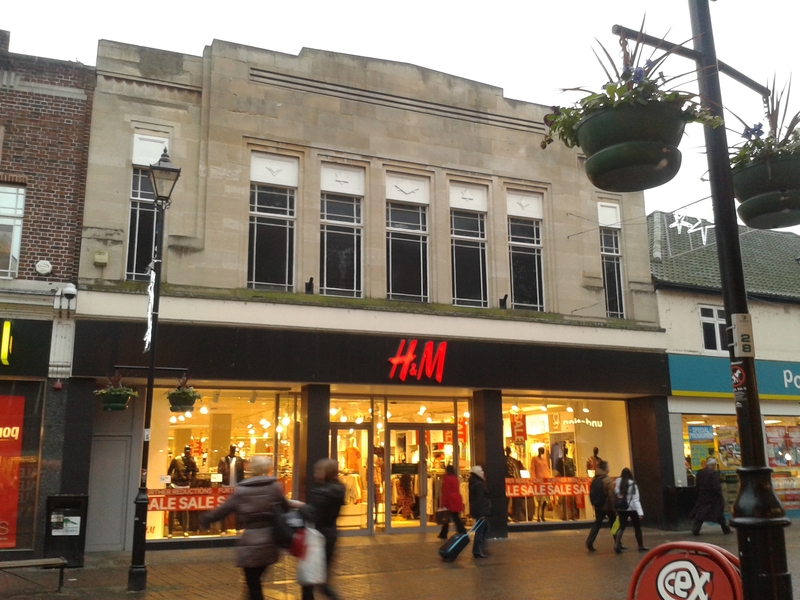 The basement was never reopened, with the stairs covered up with a large display. 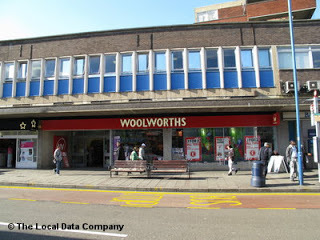 Woolworths London Road closed on 30th December 2008. 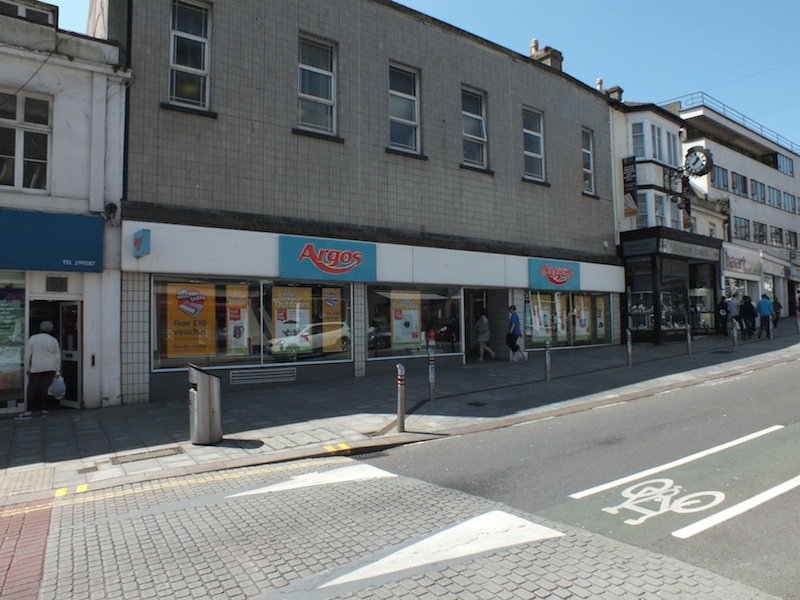 99p Stores took over the premises and opened nearly a year later on 19th November 2009. 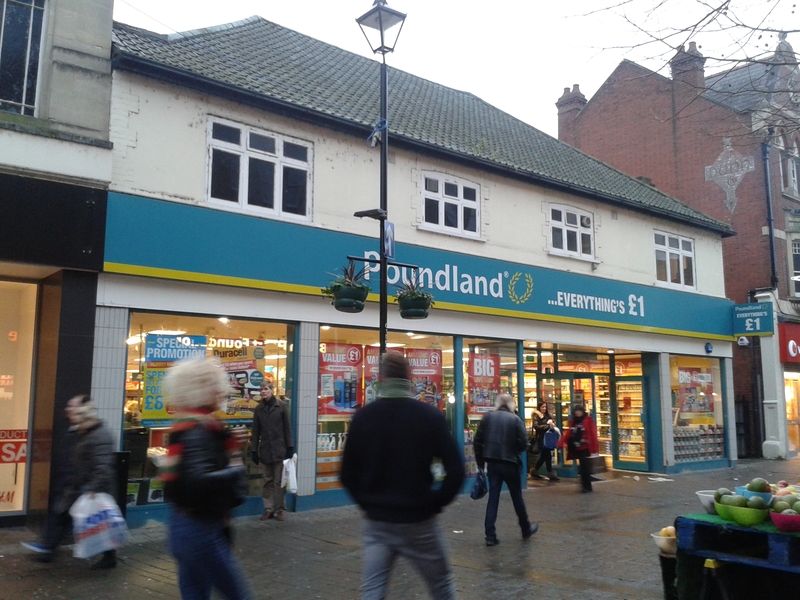 Since then, the 99p stores were bought by Poundland. 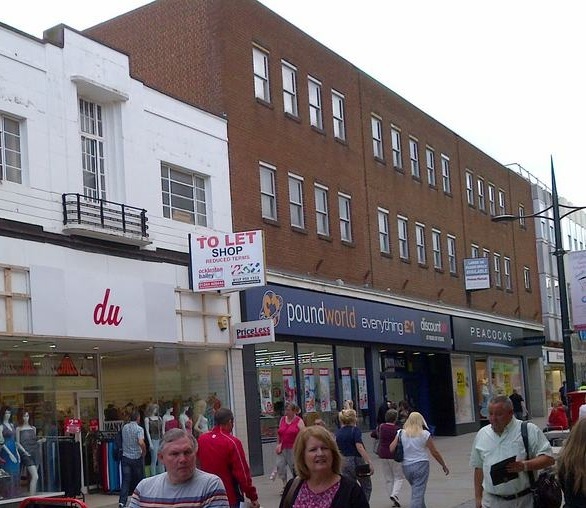 The building is now occupied by Puregym upstairs and Poundland/Pep & Co. 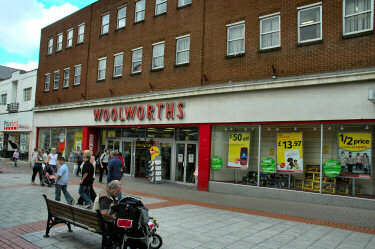 But look up and you can see the Woolworths architecture, if a bit grubby. 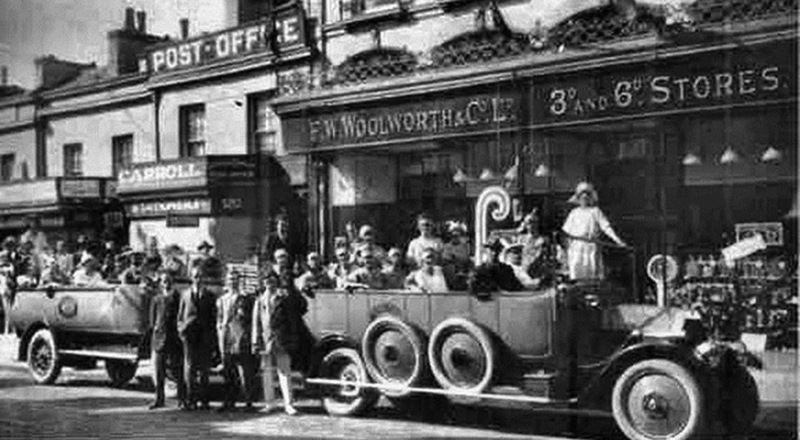 Woolworths opened its second Sheffield branch on Attercliffe Road in 1926. 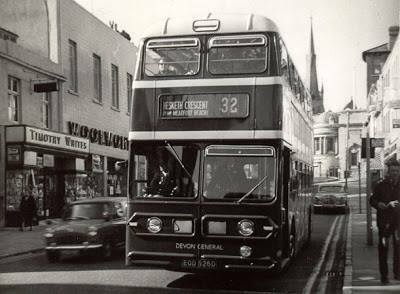 The first was on The Moor (Store 143). 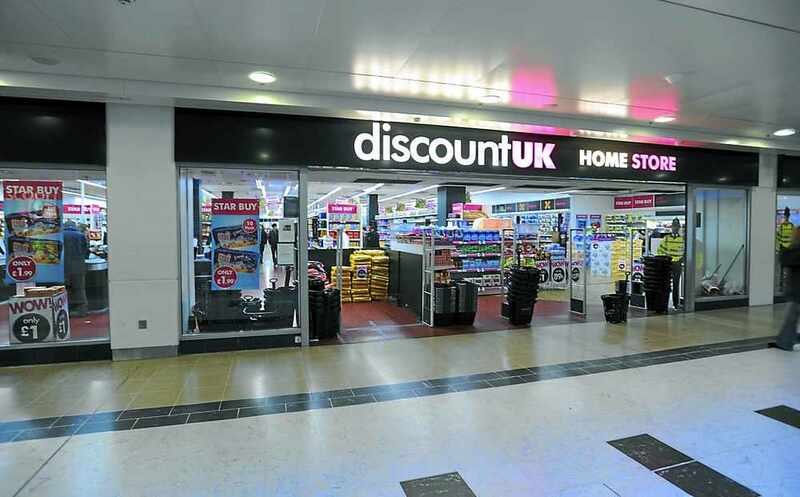 We have Graham Soult to thank for this information, as I had to message him for help when I was totally stuck on this store! 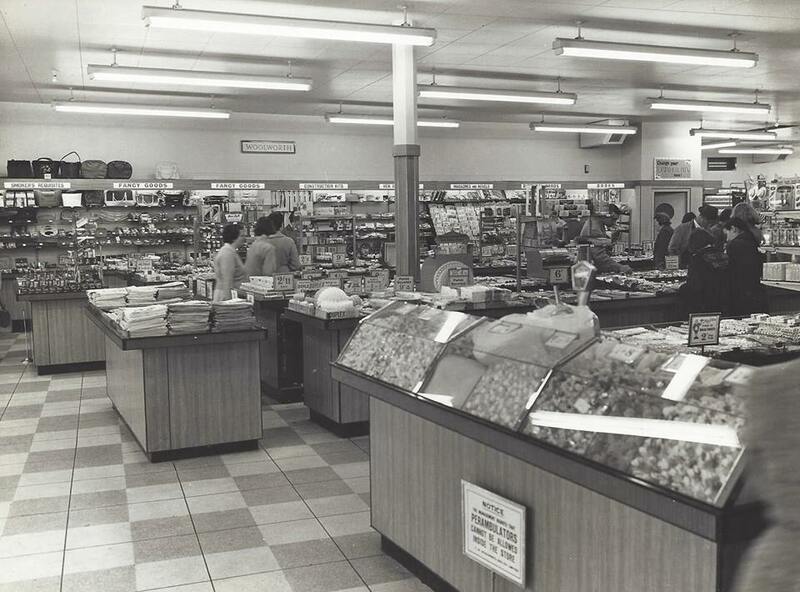 Store 222 was not on the 1972 store list, but he has told me it was on the 1957 list that he has transcribed from a handwritten list. 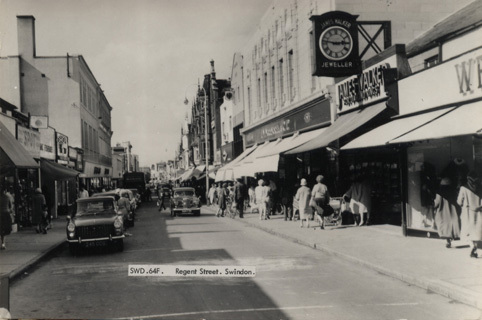 After much googling, I found a photo of the store after it closed down in the early 1960s. 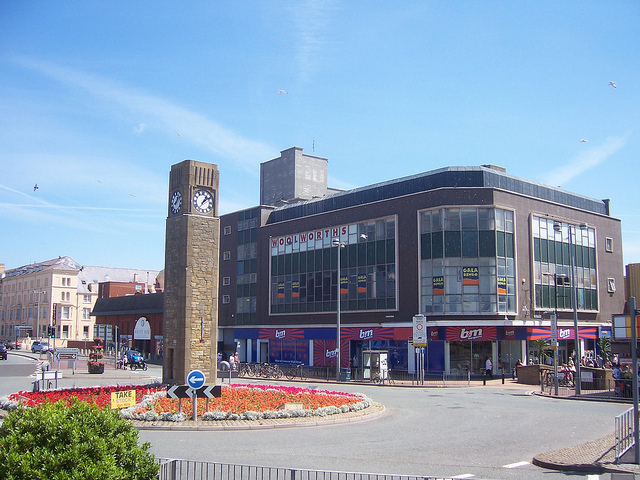 It’s the white building in the centre with the two oval windows on the upper floor. 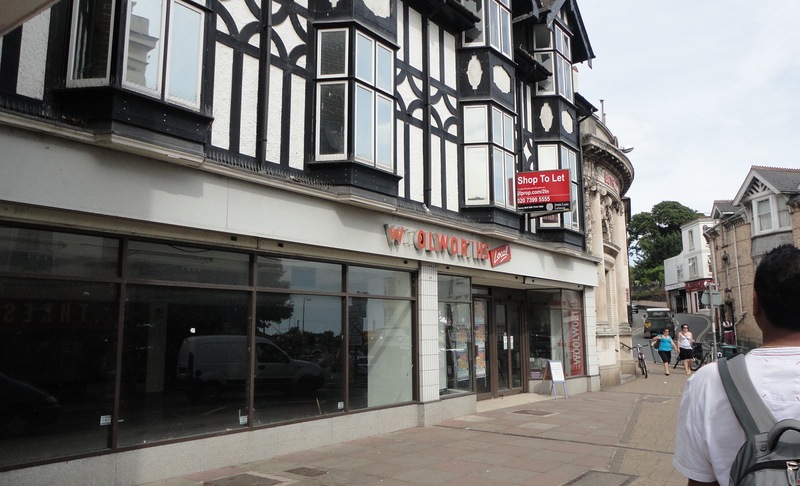 It has a sign ‘premises for auction’ over the fascia. 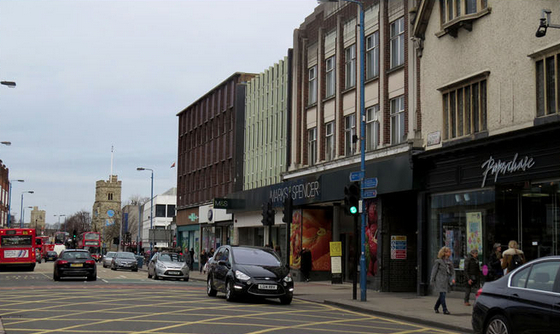 The building were demolished, as you can see from this Google Streetview screengrab. 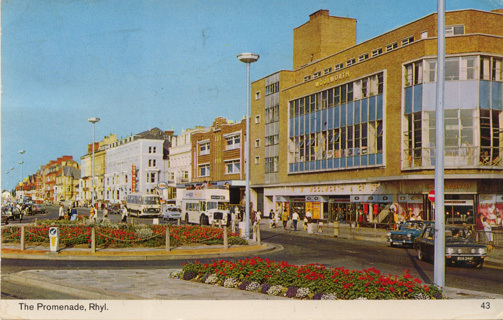 There are trees in front of a car park where the buildings in the 1960s photo used to be. 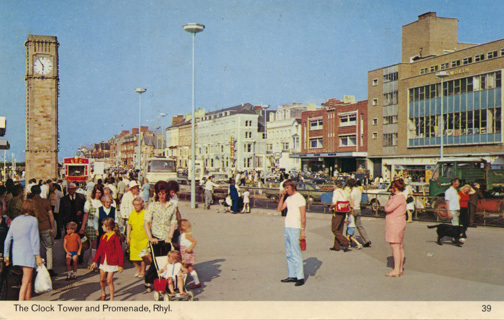 Rileys on the left side is numbers 657 – 661. 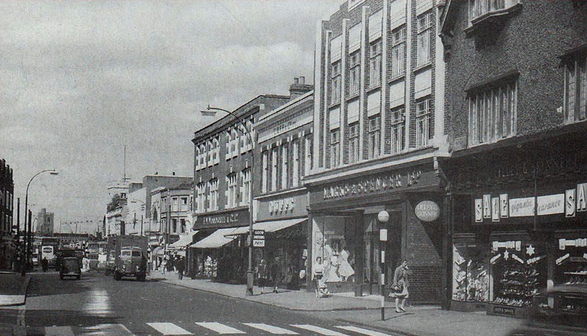 According to Wikipedia, Attercliffe Road was a busy and bustling shopping area in the early 20th century, but the area declined post Second World War. 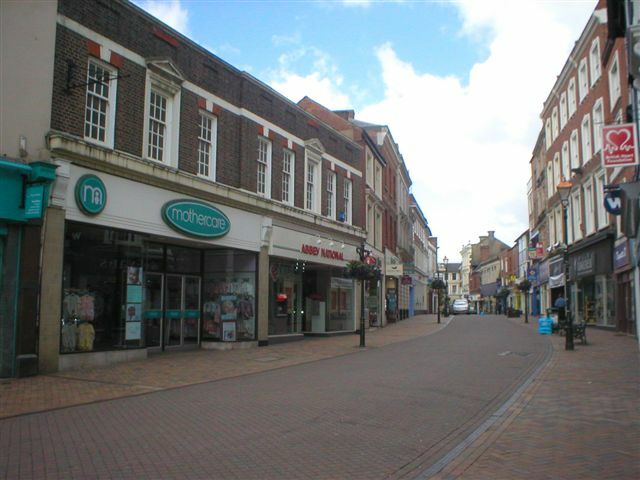 Victorian housing was cleared and not replaced, causing the local schools to close, followed by most of the local shops, while some of the local industries closed or moved to larger sites further out of Sheffield. 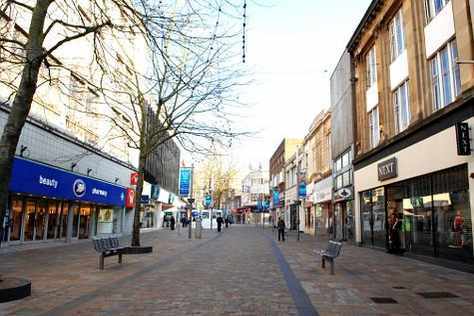 Which explains the rather abandoned look of the street today. 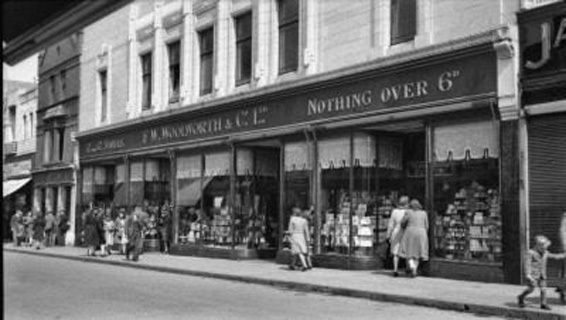 Woolworths opened a branch on Above Bar Street on 7th February 1923, alongside the original Southampton Woolies on East Street (Store 24) which opened in 1913. 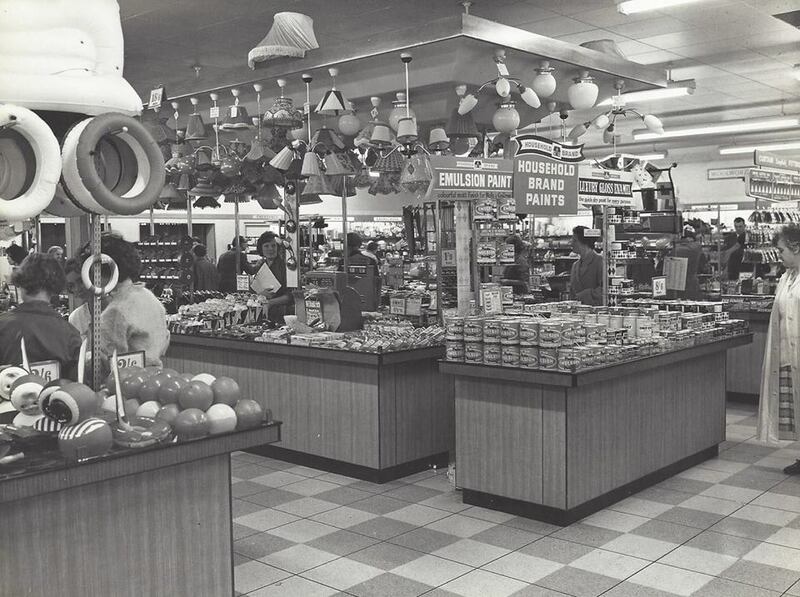 This newer one was a larger store. 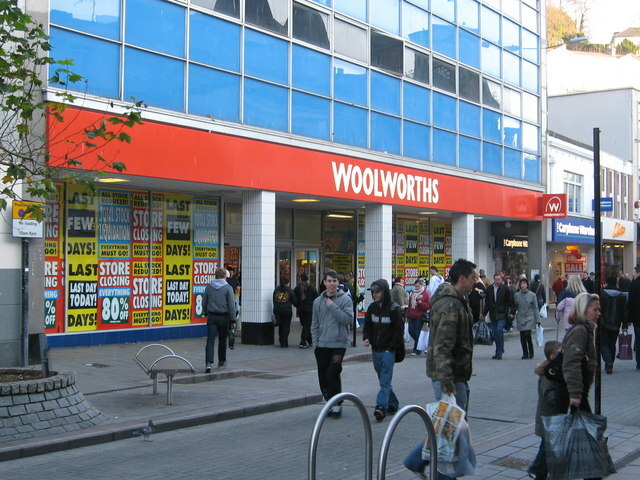 Ex-Woolworths employee Ganesh Jillah who worked at Southampton from 1997-1999 says, “I remember when Titanic was released on video in October ’98. 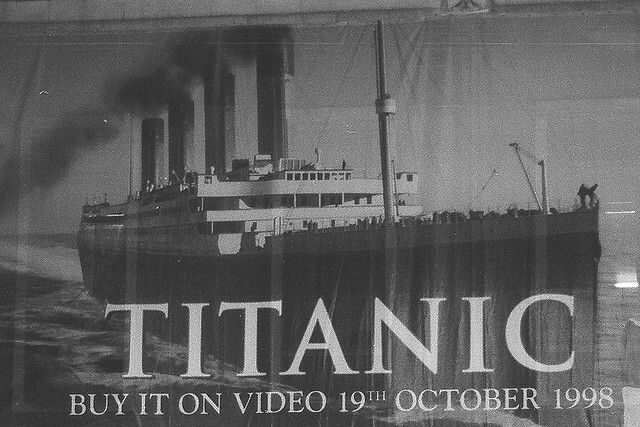 We were all working a late shift, and we had on Titanic t-shirts. 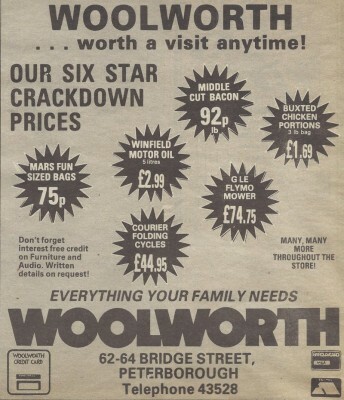 The store was open as a special event from 9pm ’til 11pm on the Sunday, or maybe it was 8 ’til 12. 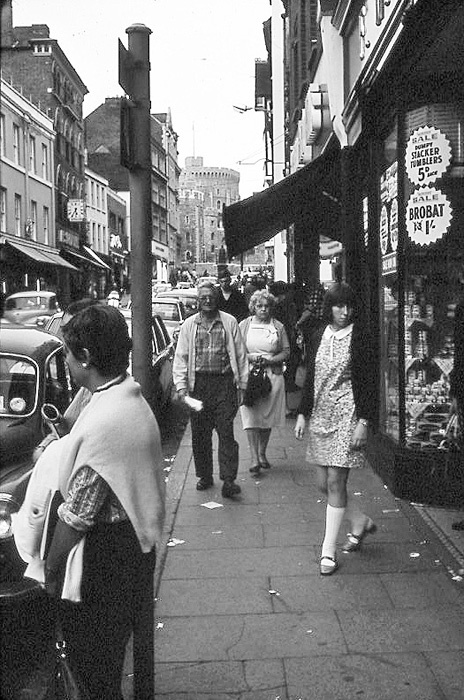 There was a big queue of people outside the store all along the street! 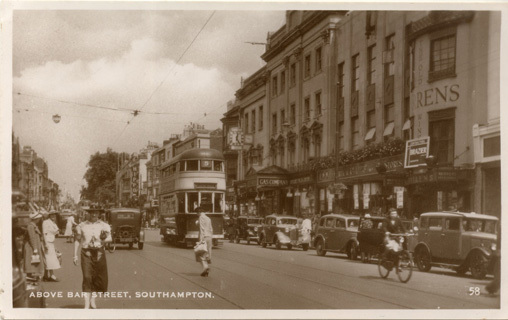 We had an orchestra playing like they had in the Titanic.” I asked him why Southampton in particular. 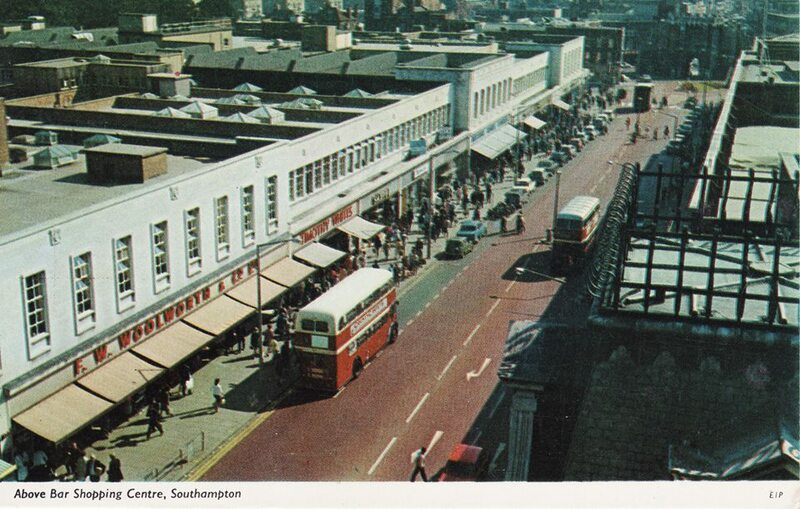 He said it was because the Titanic had sailed from Southampton. 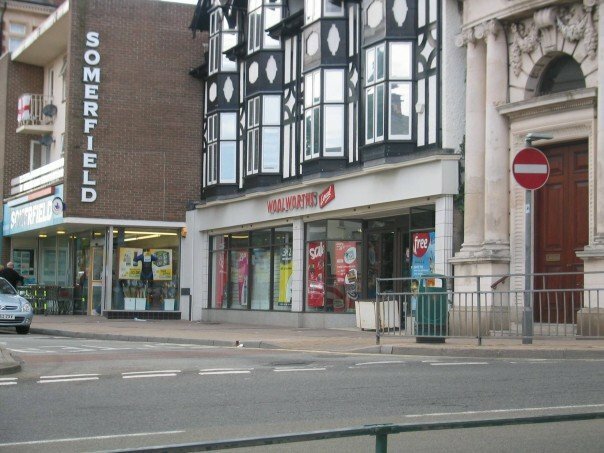 The store closed in September 2007 to the shock of many locals and employees, after the landlord offered them loads of money to end the lease 10 years early. 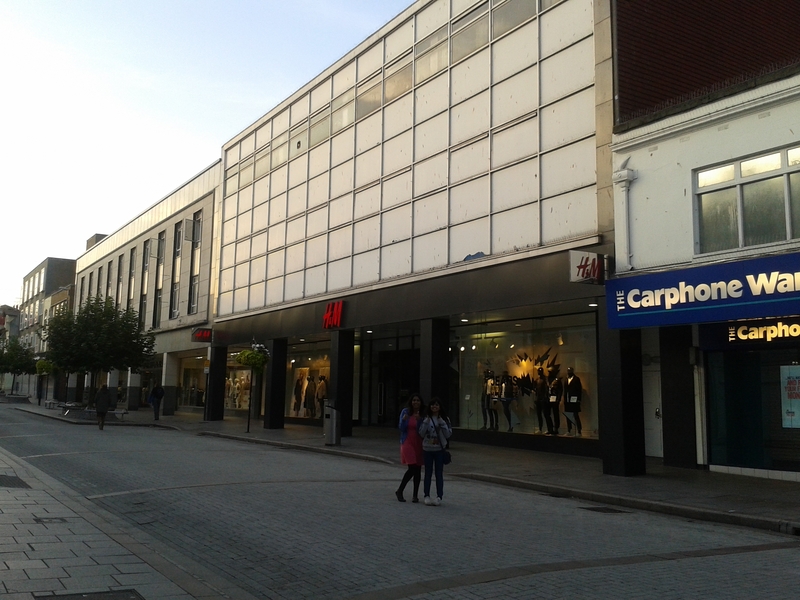 TK Maxx and the Card Factory took it’s place. 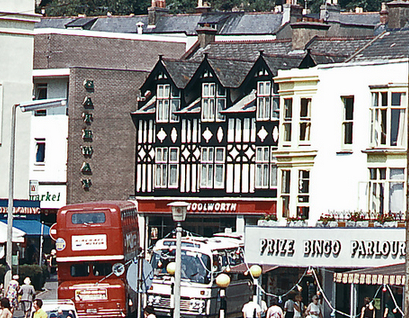 The canopies have gone but you can still see the same windows from the 1960s photo. 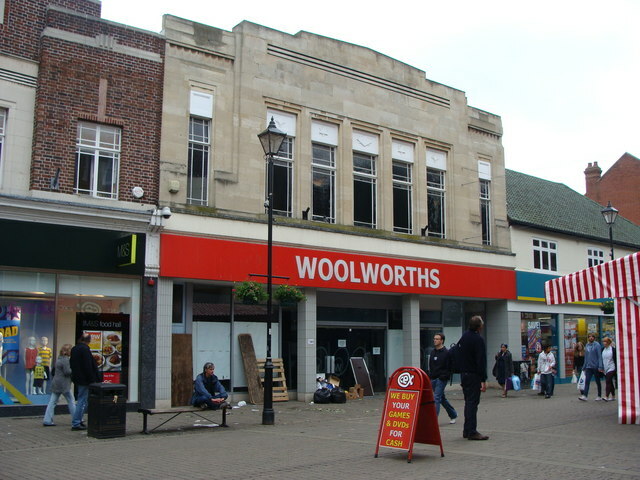 Woolworths bosses then decided to open a new store in nearby Bitterne, in October 2008 (even though there was already a closed store in this area – store 1005, 401/403 Bitterne Road). 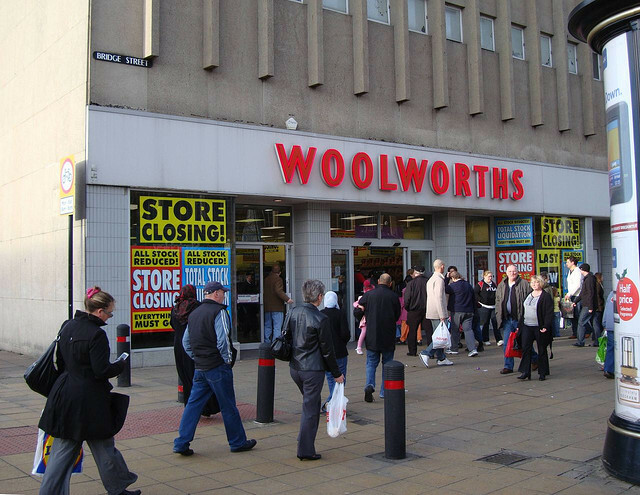 Well this new one ended up being the last new store to be opened before the chain collapsed. 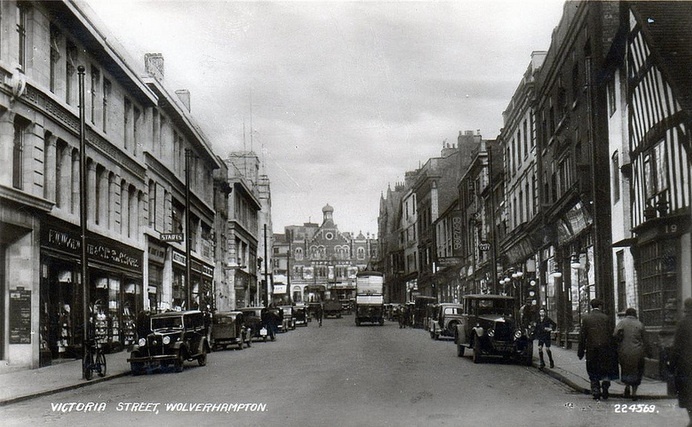 Originally, Woolworths opened in Birmingham City Centre on Spiceal Street in 1921, 6 years before the nearby New Street branch opened. 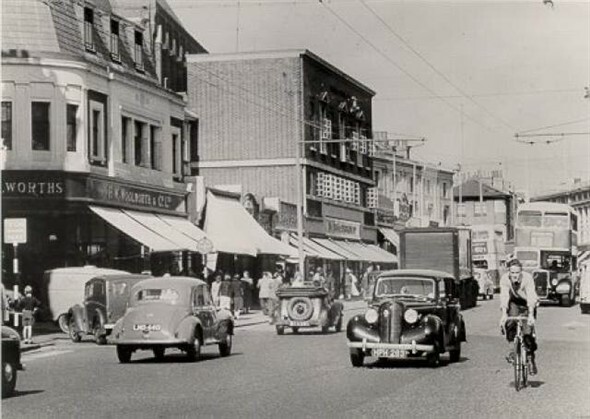 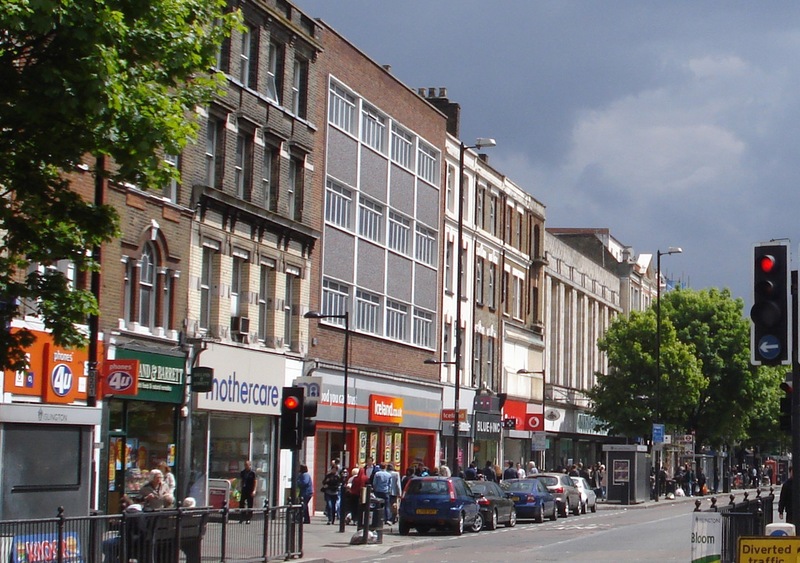 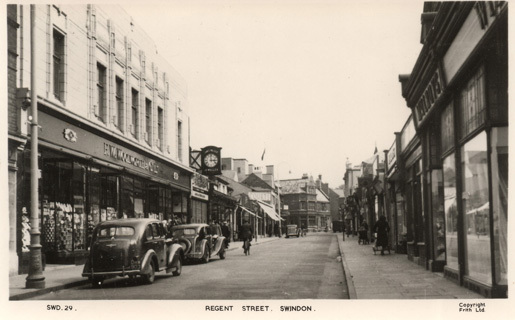 It was hugely successful in this location – sales were amongst the highest in the country in the 1930s – so they doubled it in size, with the addition of a large restaurant, and then made further enhancements in the 1950s. 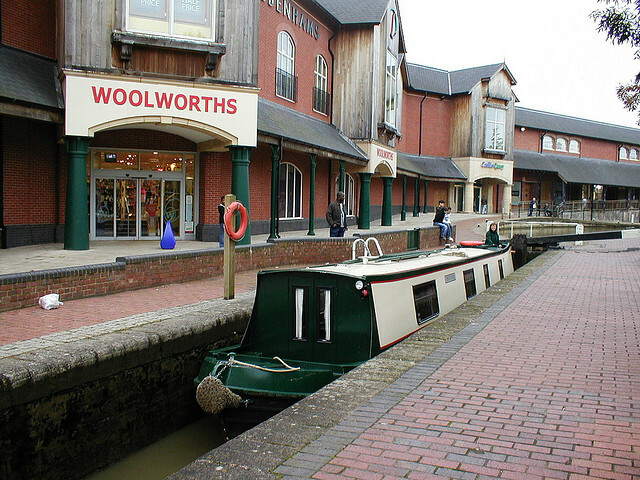 You can see below how it is over 2 stores. 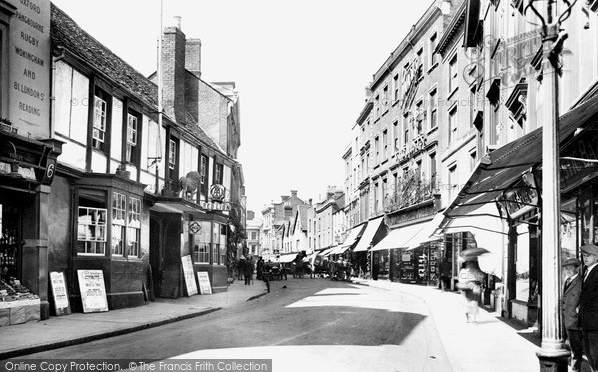 I have included the below photo so you can see the location of the St Martin church – this is how we can work out what is in the same location today. 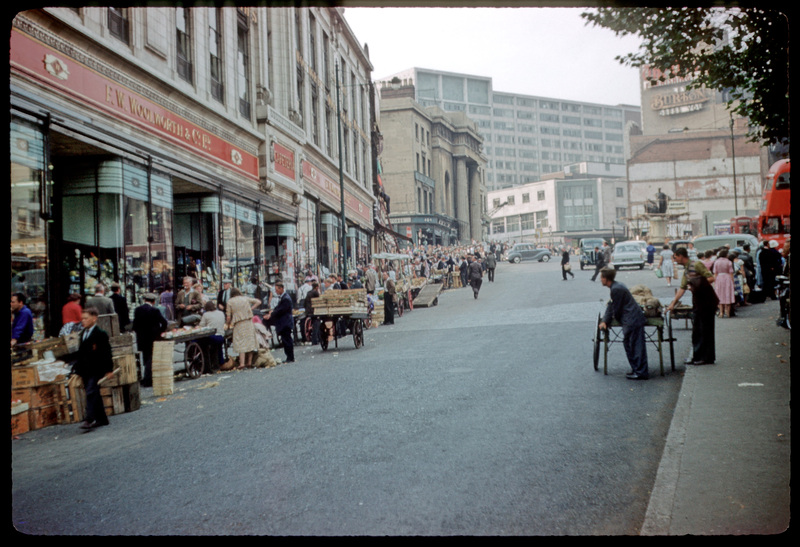 This is in 1962 when the new Bull Ring Centre store is being contructed with the old store next door still trading. 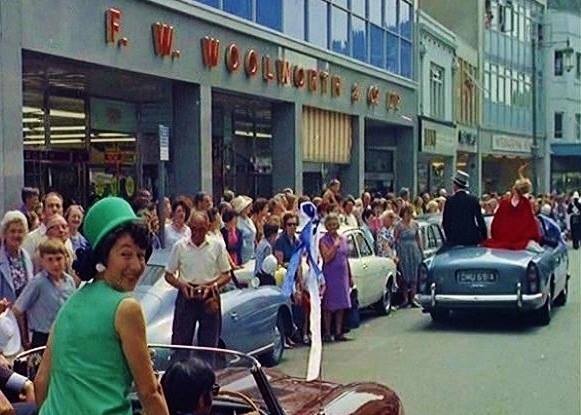 Below is a photo from 1966, showing the ultra-modern new flagship Woolworths. 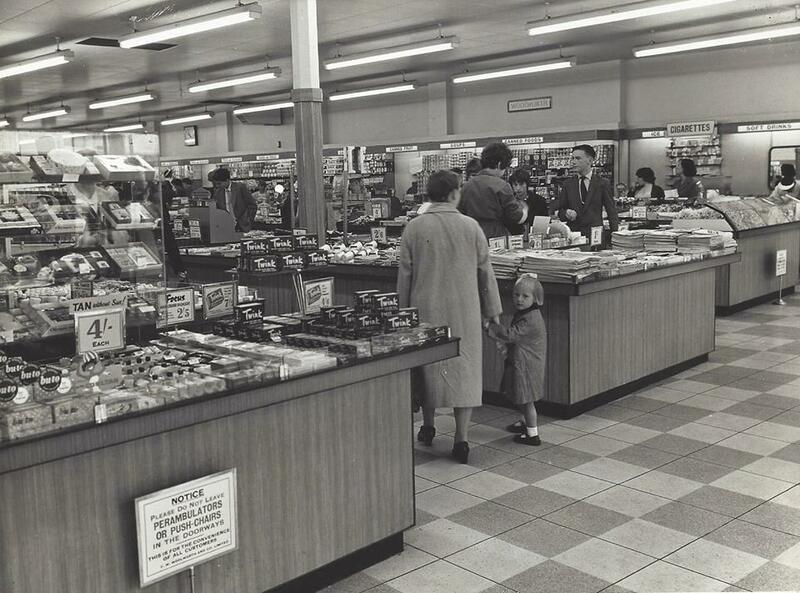 It was the superstore of its time, with modernised ranges and shop-fittings, featuring a large foodhall, an extended clothing range, plus a top floor cafe where they had a ‘never seen before’ iced water machine. 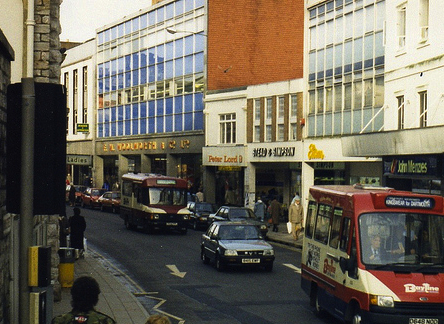 Unfortunately, just 20 years later, in 1983 the store closed for business, when the board decided to sell larger stores to release capital – “The Bull Ring store was one of the first to be disposed by Kingfisher in 1983 to another developer planning to raise the whole site to the ground and replace it with something architecturally significant.” (Source: 100thbirthday,co.uk) There wasn’t a Woolies in the City Centre until the 1990s when they re-opened in the Pallasades Shopping Centre. 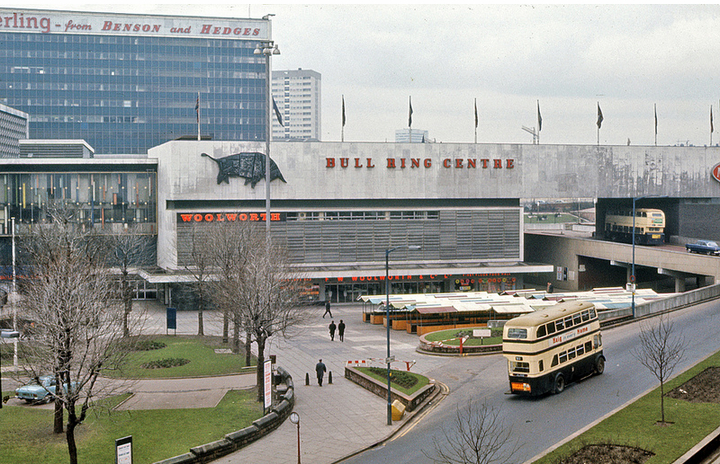 Some forums say Mark One traded from this building in the 1990s, but this was on the other side of the ramp – so I am presuming it lay empty for decades, before the Bull Ring Centre was demolished in 2000. 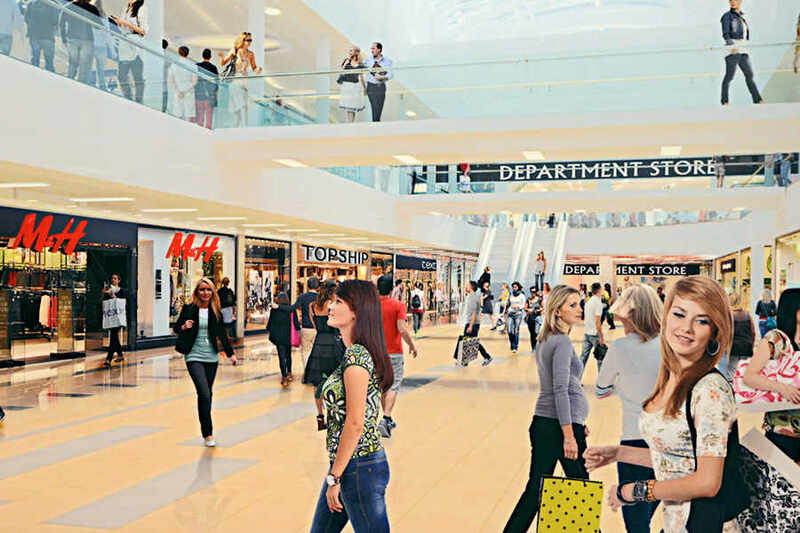 The new Bullring shopping centre was then built, opening in September 2003. 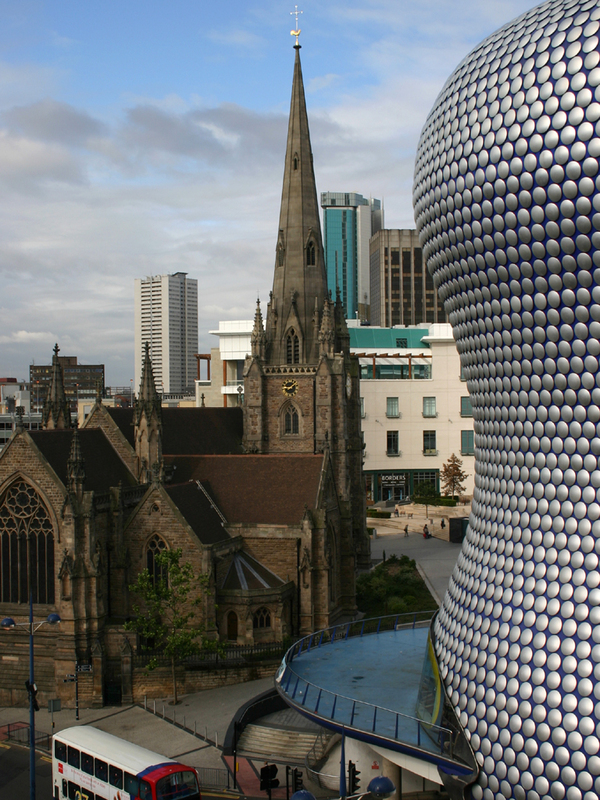 Below is a photo from 2007 after the new shopping centre was opened with the new Selfridges chain-mail building in the foreground. 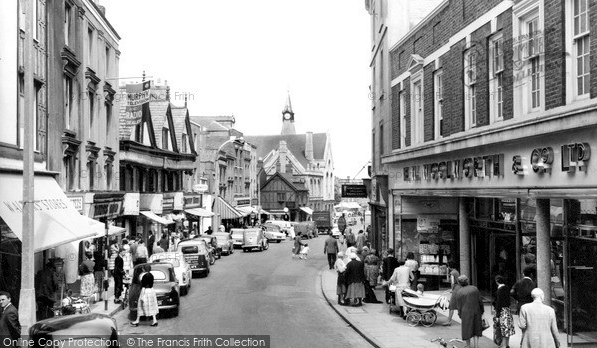 Behind the church is Borders which looks as though this was where the original Woolworths building would have been. 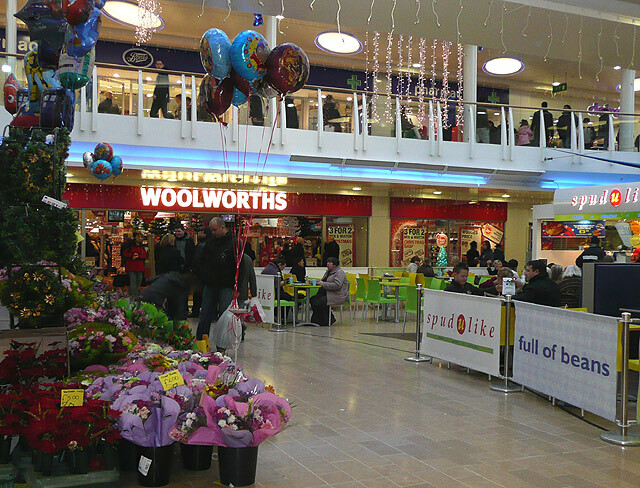 Borders have since closed down. 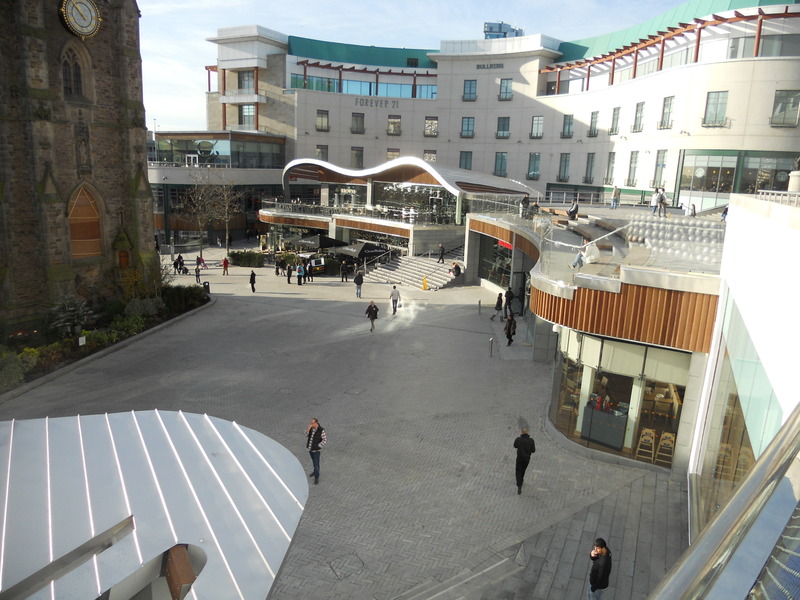 In 2011, the Bullring was extended to have a new ‘Spiceal Street’ centre with restaurants (see below). 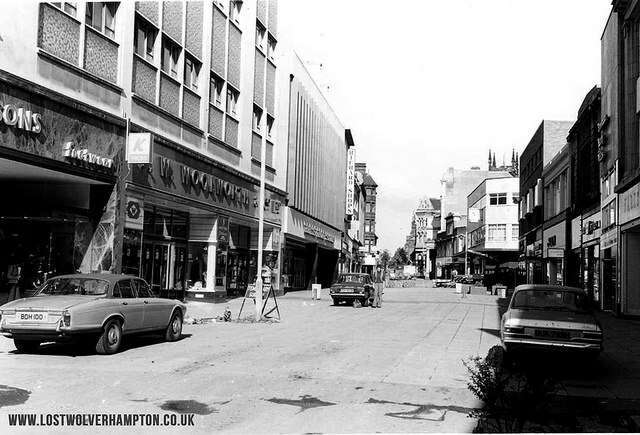 So I would say this corner is where the Bull Ring Woolworths once stood. 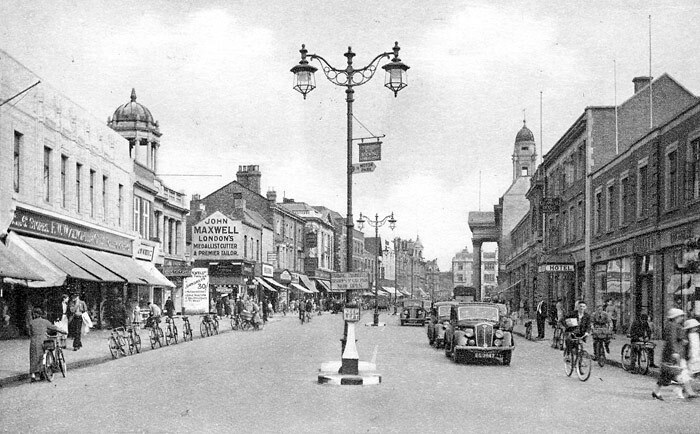 They extended in 1931, and added a restaurant in 1935, which you can see here (the lighter coloured buliding on the left side of the road). 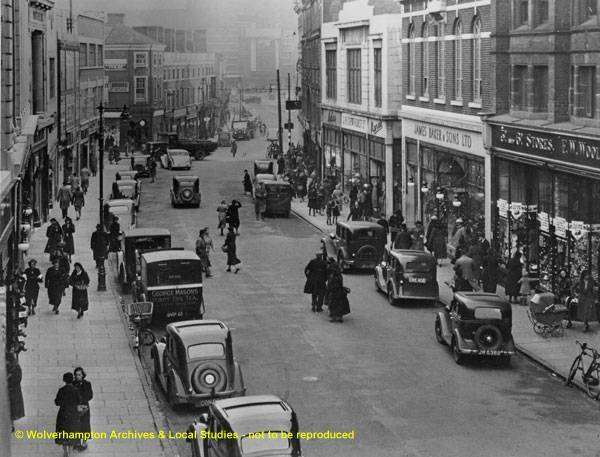 There was a small shop called Dunn & Co on it’s right, and the City Cinema was next to it (that’s the building with the dome) – this later was demolished and M&S was built here. 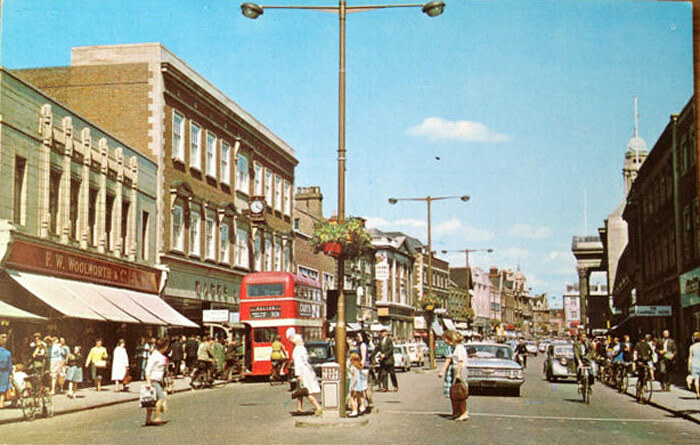 Between 1969 and 1972, they had a major 60s-style makeover, reconstructing around the original shell. 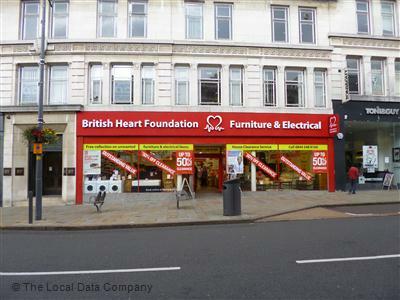 Interesting use of the logo in yellow. 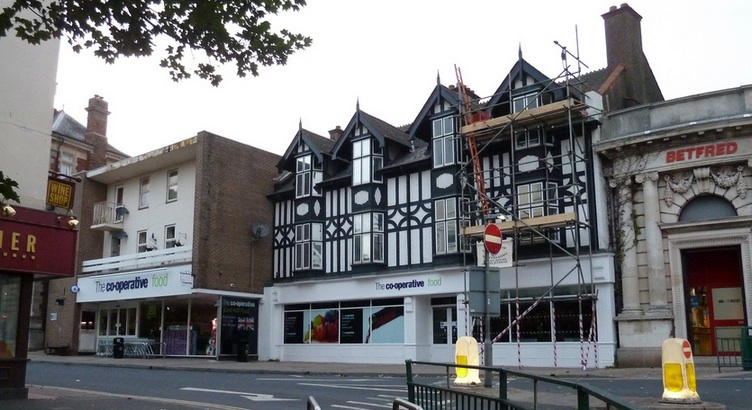 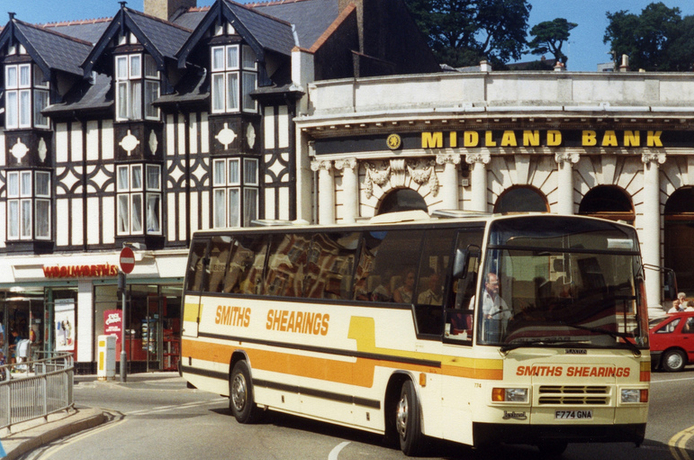 Some say this was the ugliest building in Bridge Street! 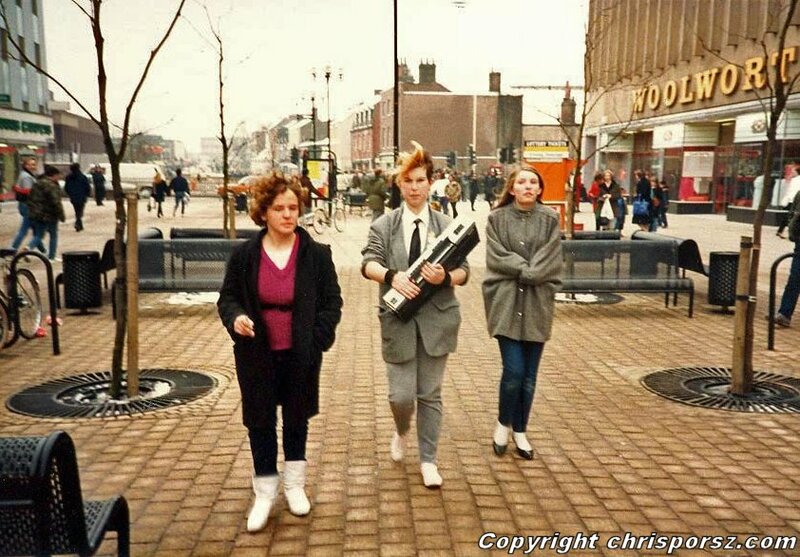 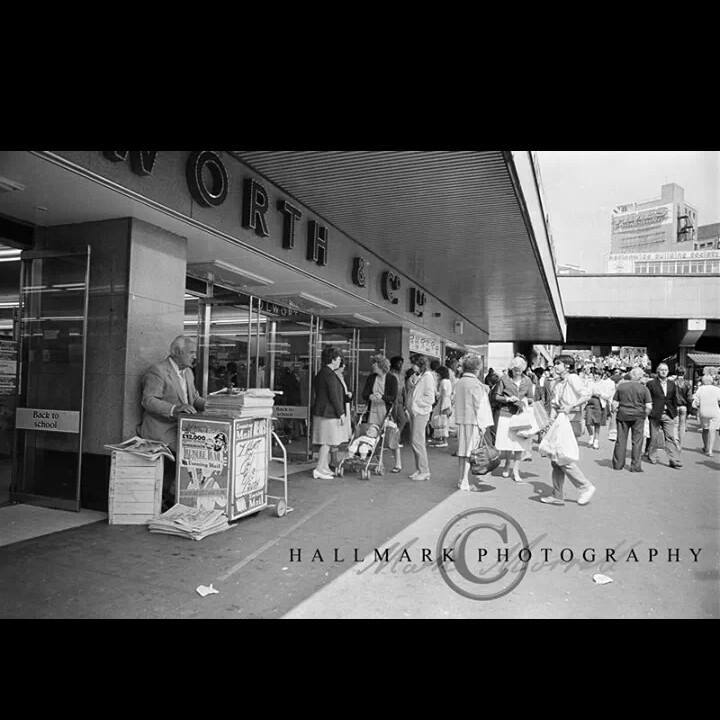 I love this 80s photos, doesn’t the Woolworth sign look massive?! 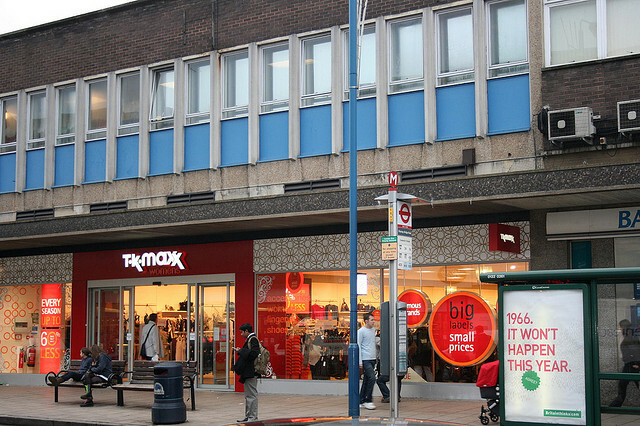 In 1988, 1991 and 1993, the store was reduced in size. 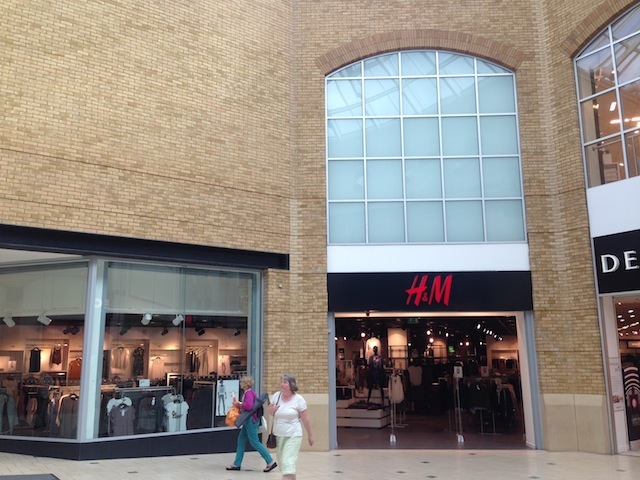 Half of the building was let out to other stores, and more recently it has been shared with New Look. 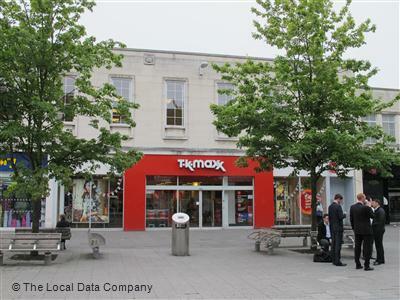 After 2 years vacant, TK Maxx took over the space in Spring 2011. 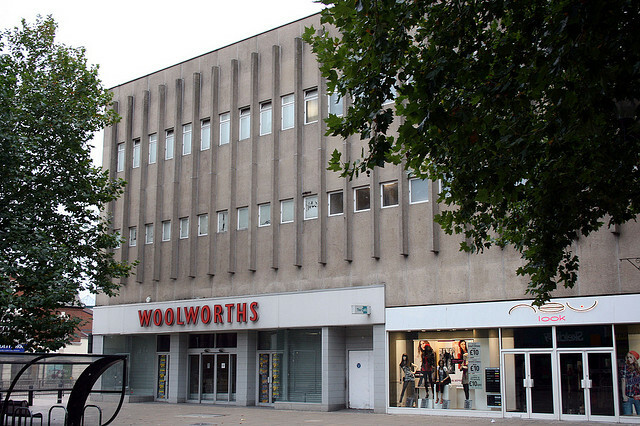 Here it is, where you can see how large the buliding is, and how it must have been a huge Woolworths in the 1970s. 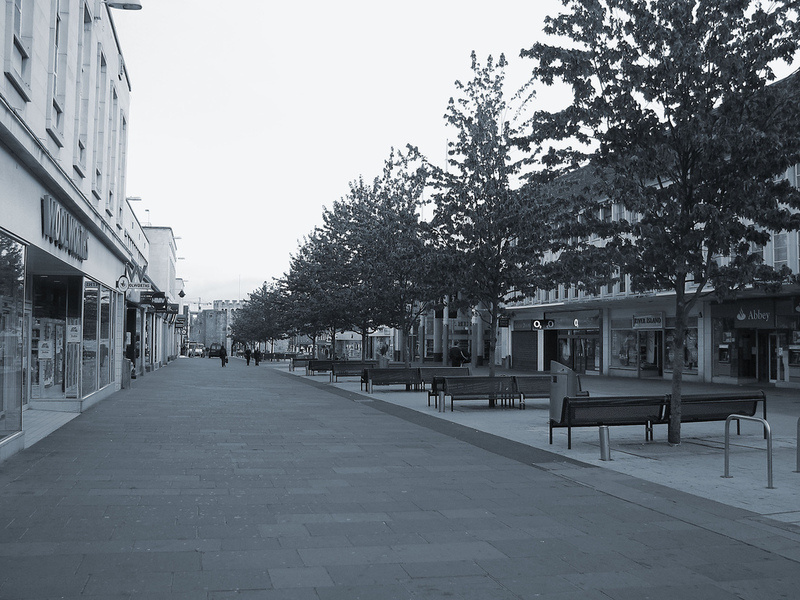 And how those trees, which must been planted when the street was pedestrianised in the 80s, have really grown! 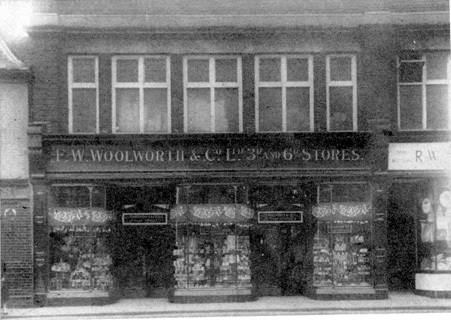 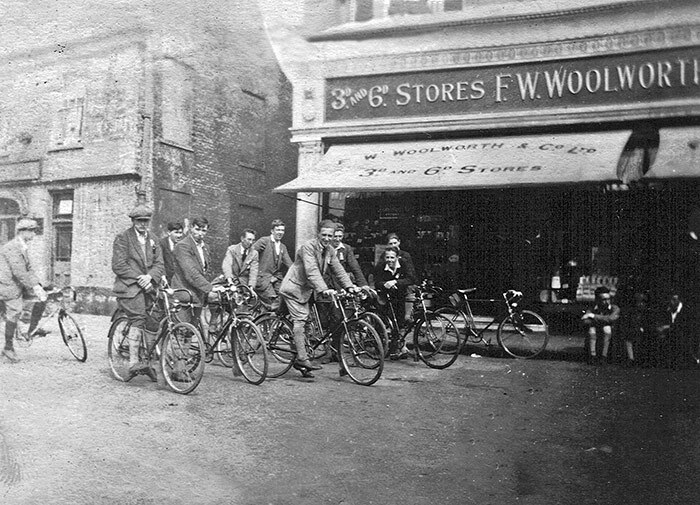 Six years after the first Woolworths opened in the UK in 1909, the fifty-fourth store was opened at 18 Commercial Road, The Square, Bournemouth in 1915. 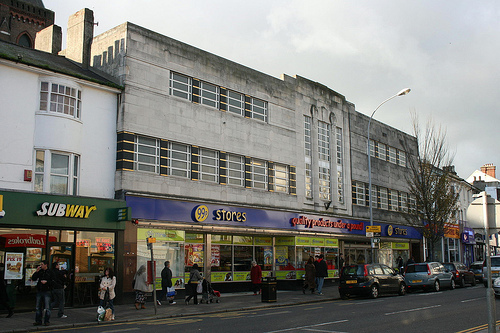 The store was extended to include 20 Commercial Road (previously Bon Marche, drapers and milliners) in 1931 with an impressive Art Deco “cinema frontage”. 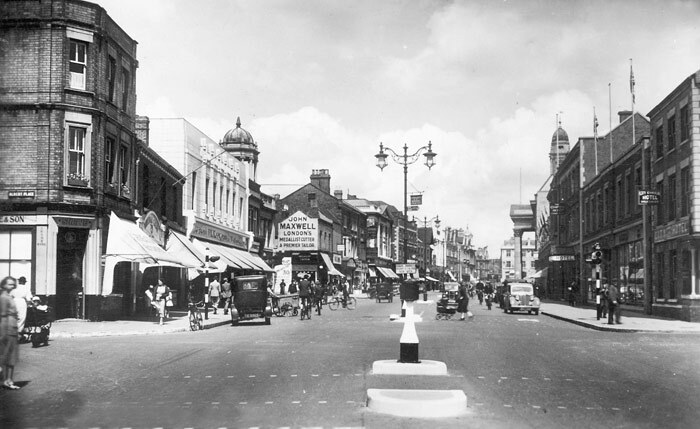 Alas, this was destroyed by enemy action on 10th April, 1941, when a single oil bomb (incendiary bomb) gutted the building in the same raid that destroyed the new Art Deco Beale’s store. 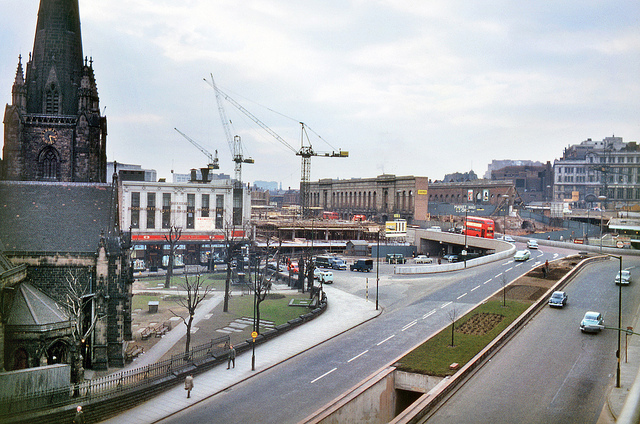 The site remained a gap for more than a decade before being reconstructed and reskinned in Portland stone in the 1950s. 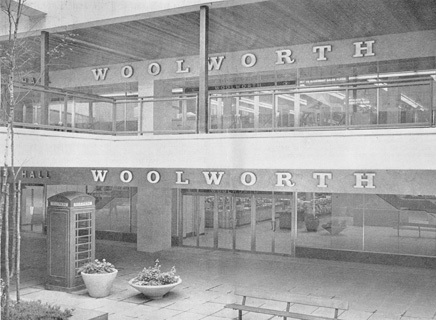 It was a huge Woolworths store, with two staircases at the end, with a photo booth at the bottom. 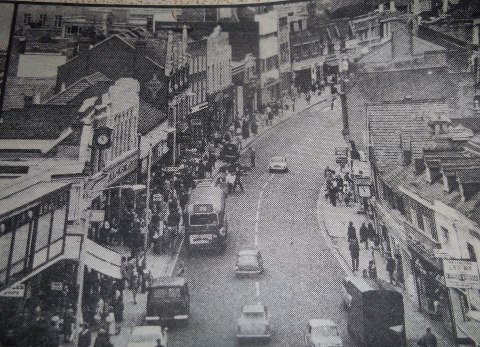 On the top floor was a cafe bar. 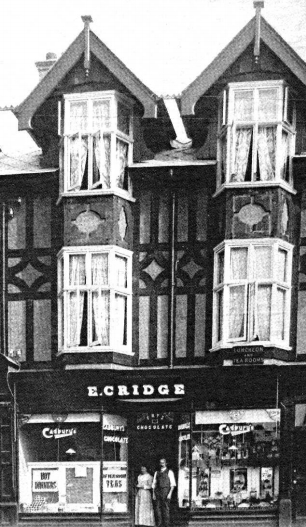 In 1983 this store was sold to Boots (which relocated from Old Christchurch Road/Post Office Road) as part of Kingfisher’s asset disposals. 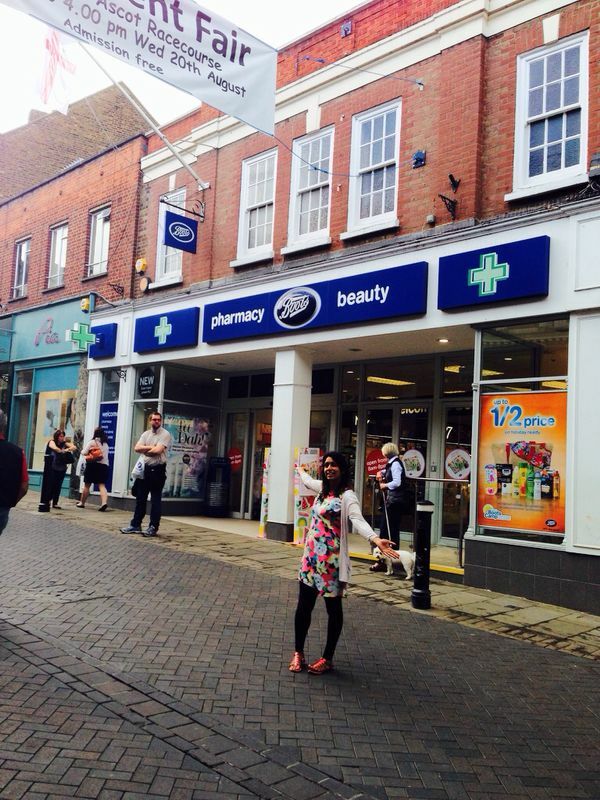 It is still a Boots store today. 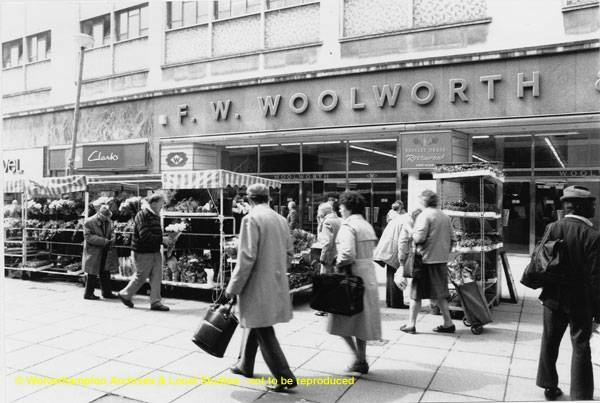 The third Woolworths store to open in the UK was also in Liverpool, on London Road, just two miles away from the first store in Church Street. 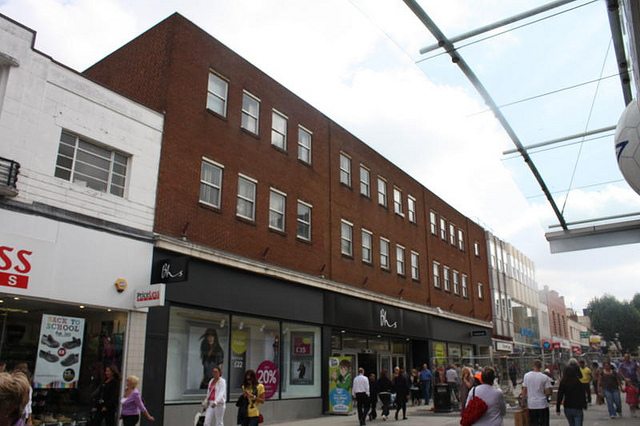 The building was offered at a low lease from Owen Owen (remember that department store! 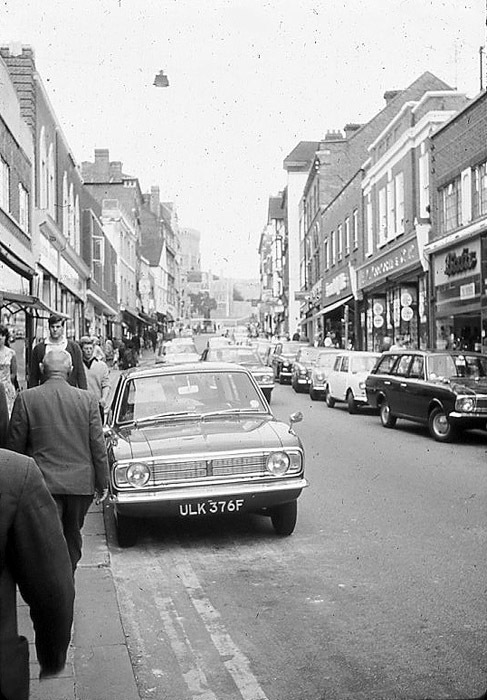 ), whose owner was impressed by the product offerings in the Church Street store. 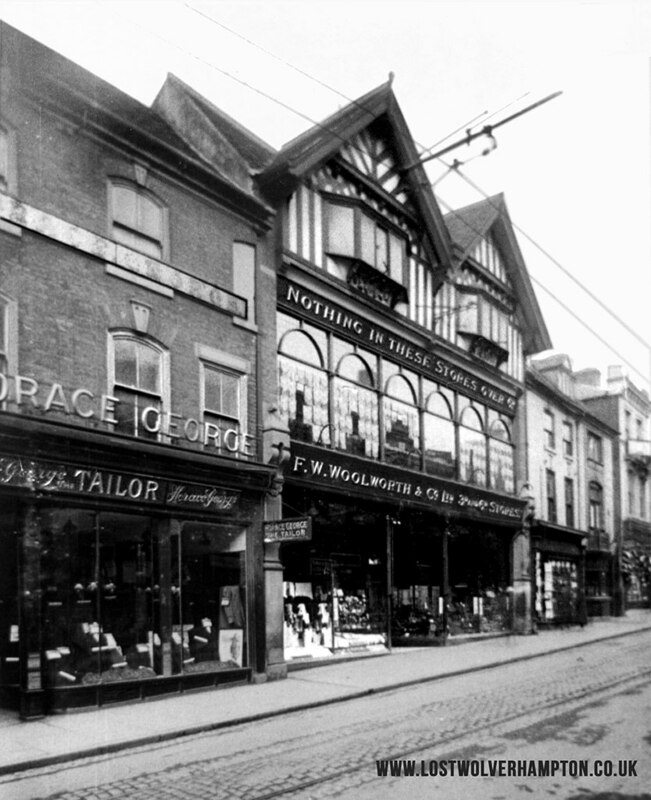 It actually opened one day before Store 2 (there was a race between the stores as to which would be ready first), and they opened on 4th February 1910. 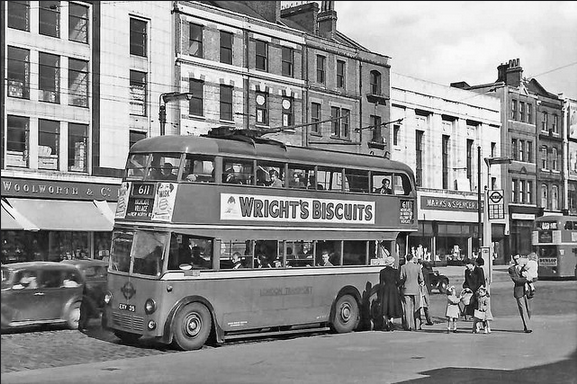 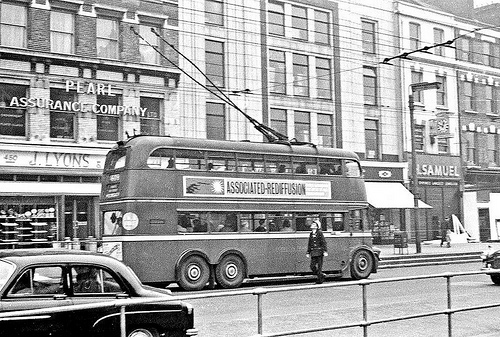 From the caption in the below photo, it seems as though the original building may have been demolished, or they erected a new purpose-built store further along London Road, in 1962. 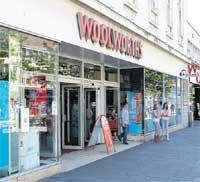 The store closed down, possibly another one of the casualties of the 1980s closures. 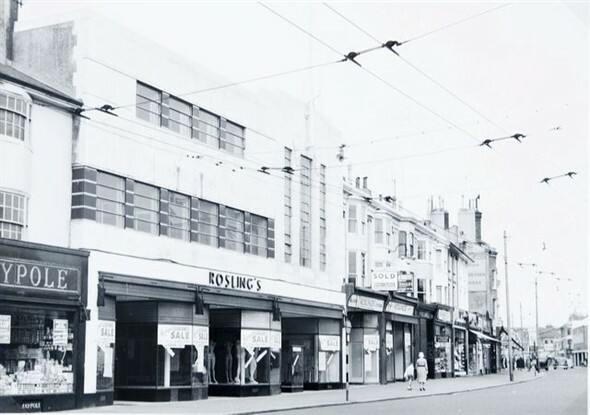 The building was an amusement arcade for a while – though they kept the back of the Woolworths store windows, doors and mosaic floor. 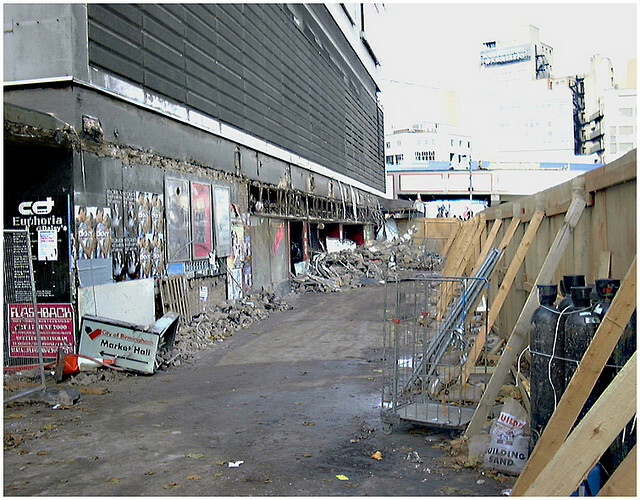 This photo was taken in 2009. 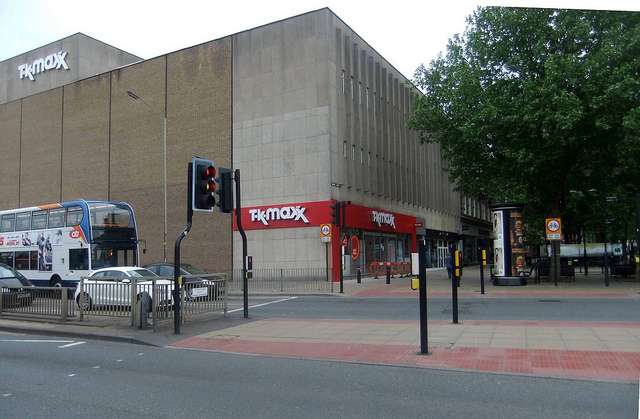 It’s all gone now, not a trace left, as a Tesco Express now takes the place of 91-93 London Road, Liverpool.